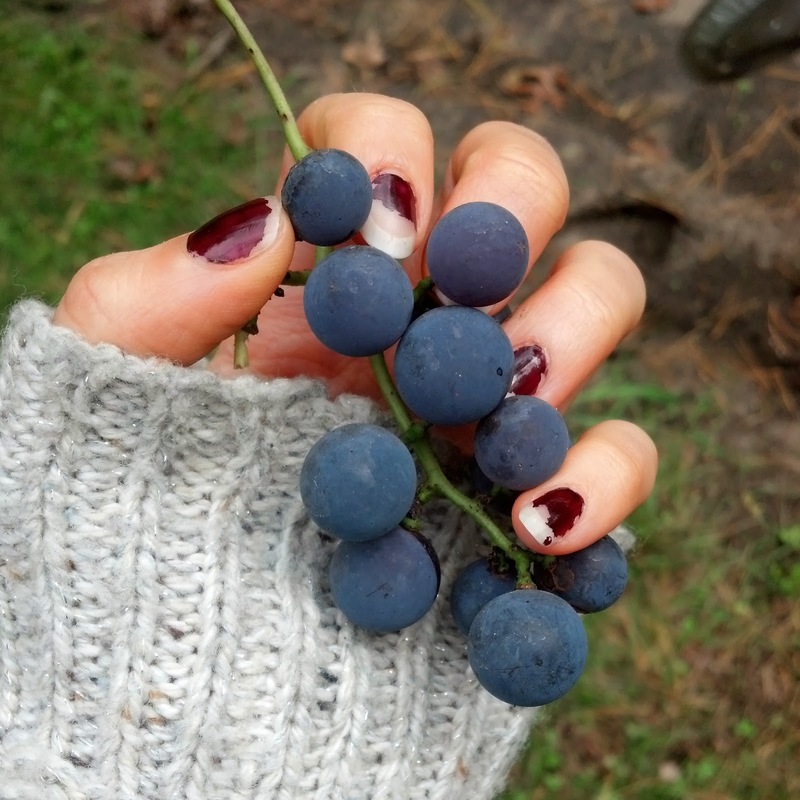 Recently salvaged from the remnants of our garden, grapes have been my go-to snack food for the past week or so. I've always liked grapes, but the ones we have growing just taste so delicious and sweet (they are like little balls of fresh, homemade wine!). I literally have been giving myself stomachaches because I'll be sitting there, snacking on grapes mindlessly without realizing that I have eaten about half of our supply in one sitting...not to smart, but I can't help it! Acting upon my cravings, I decided to incorporate grapes into my bowl of oats this morning. Grapes are so refreshing, yet the candy-like sweetness of them makes them great for comforting, thicker Fall dishes. As cinnamon is a staple in all things Fall-related, I made sure to include the sweet and spicy flavor in this bowl as well! The tangy sweetness and squishy texture of the grapes blends wonderfully with the hearty crispiness of pears, so I decided to pair the two together in my oatmeal bowl. Both of these fruits are in season now, so run to your store (or yard!) and grab them while they last! I also had blueberries laying around, and since I like the combination of pears and blueberries together, I threw them into the mixture as well. Since oatmeal doesn't always fill me up, I wanted to make this oatmeal heartier, healthier, and more filling. I added healthy sources of protein and fats, thus resulting in a satisfying, warm morning breakfast that was cozy, comforting, and downright amazing. Take advantage of the season's ingredients and try something a little out of the ordinary yet delicious with this Cinnamon Fall Harvest Grape and Pear Protein Oatmeal Bowl (now that's a mouthful!). Set a pot of mixed almond milk, water, and a lot of cinnamon on the stove, cover, and heat on medium heat until it begins to boil. Once the liquid is boiling, uncover and lower the heat to medium-low; stir in the oatmeal. While the oats are simmering, crack two egg whites into a bowl and whisk until they are beginning to turn frothy. After the oats have been cooking for about 2 minutes, pour in the egg whites, half the pear cubes, and half the grape quarters. Stir everything together, and continue stirring for about 3 minutes. After 3 minutes, set the burner to a low heat and just let all the flavors simmer together. At this point, you can add a dash of salt and more cinnamon if you would like. After about a minute or so, remove the oats from heat and transfer to a bowl. 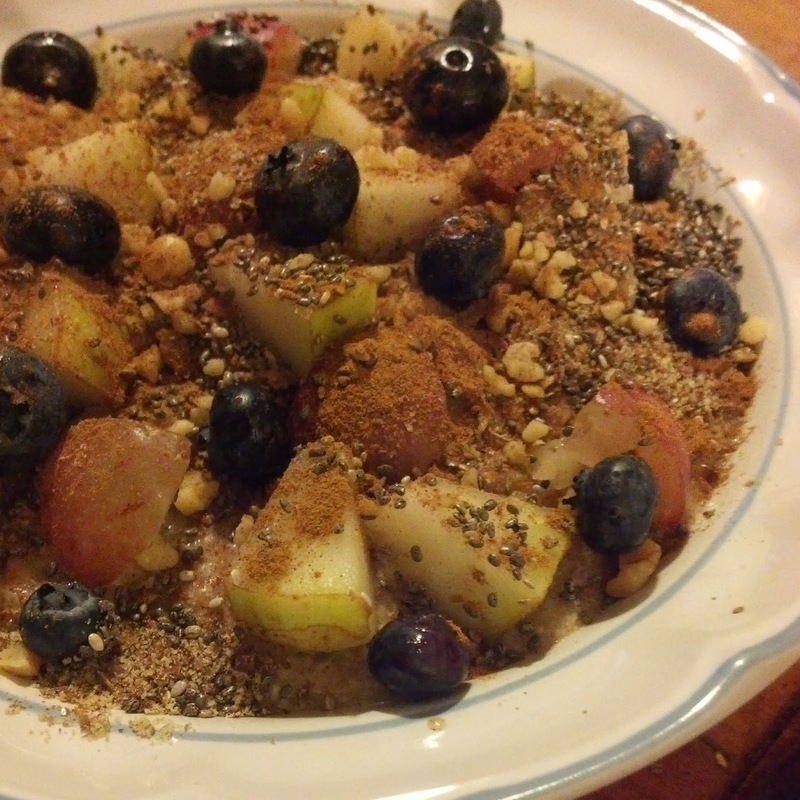 Top the bowl with the remaining pear cubes and grape quarters, blueberries, flax seed, walnuts, and chia seeds. Partake in this warm, yummy bowl immediately, and enjoy the myriad of flavors and textures while your belly becomes good and full!